Erica Beeney’s screenplay for The Battle of Shaker Heights was chosen as the second winning entry in Matt Damon and Ben Affleck’s popular HBO series Project Greenlight. Similar to another Greenlight release Stolen Summer, 2003’s The Battle of Shaker Heights surrounds the friendship of two boys coming of age. 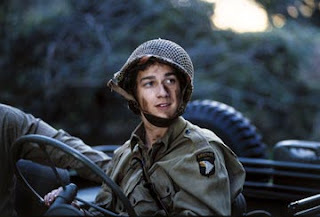 Sweet natured and original, the undisputedly predictable yet charming film helped introduce the world to former Holes star Shia La Beouf before he became a new sensation with roles in Hollywood hits such as Transformers. Set in the Cleveland, Ohio suburb of Shaker Heights, La Beouf plays Kerry Ernswiler but highly intelligent teenager who spends his weekends as a civil war reenactor where he befriends the wealthy, kind Bart Bowland (Elden Henson) who not only gives him access to his father’s collection of legendary battle artifacts but also introduces him to his gorgeous but engaged older sister Tabby (Amy Smart), on whom Kerry develops a hopeless crush. The son of hippies in the from of a recovering addict father who sometimes lets the at risk homeless people he works with sack out on the family sofa and a mother who runs a bizarre sweat shop mass producing portraits of horses with her Asian staff, Kerry spends increasing amounts of time with Bart. Along with his new friend, Kerry tries to devise a strategy to take on the school’s biggest bully who incidentally is the son of Kerry’s exasperated history teacher who gets routinely challenged by the young war buff in class. Although the ending wraps things up far too easily and abruptly and the film at times feels uneven in its tone which further research revealed may have been indicative of the studio’s battle to turn the film into a teen comedy whereas the filmmakers intended it to be a drama, it’s still an entertaining time-waster and even more enjoyable than the Affleck/Damon production Stolen Summer.